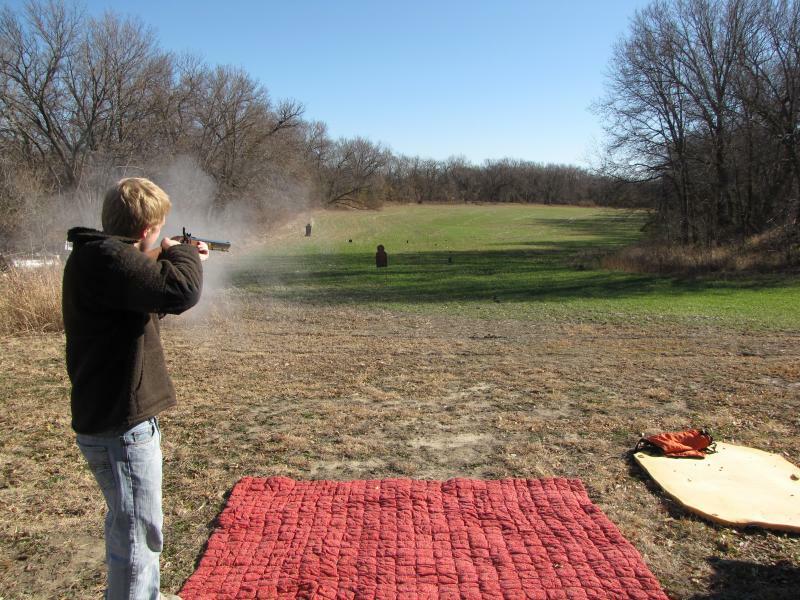 The Target Guy - We put the FUN back in target shooting!!!!! It shall be the buyers responsibility to ensure you know how to use these items in the event you actually use them as shooting targets or for any other means. Be sure of your background and use safe shooting techniques. Shooters & buyers assume all responsibility in the use of these targets. Any moral , ethical, religious, implied or otherwise thought will be that of the buyer. Seller(s) assumes no responsibility other than delivery of purchased items. Thanks! ﻿﻿﻿ Your order will usually be shipped out in 2 to 3 business days, sometimes longer, many times sooner. I have a full time job so please understand. Contact me for rush orders. We put the FUN back in target shooting!!!!! Your order will usually be shipped out in 2 to 3 business days, sometimes longer, many times sooner. I have a full time job so please understand. Contact me for rush orders. Each FLESH EATING ZOMBIE IS 10" tall and 3/16" thick. 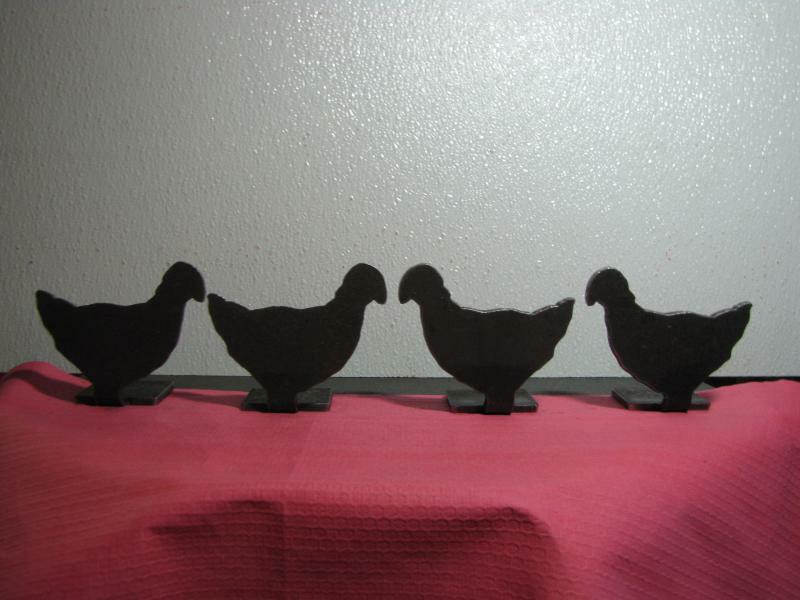 Cut from 7 guage hot rolled steel.﻿ Base is made from same material, allowing them to stand. 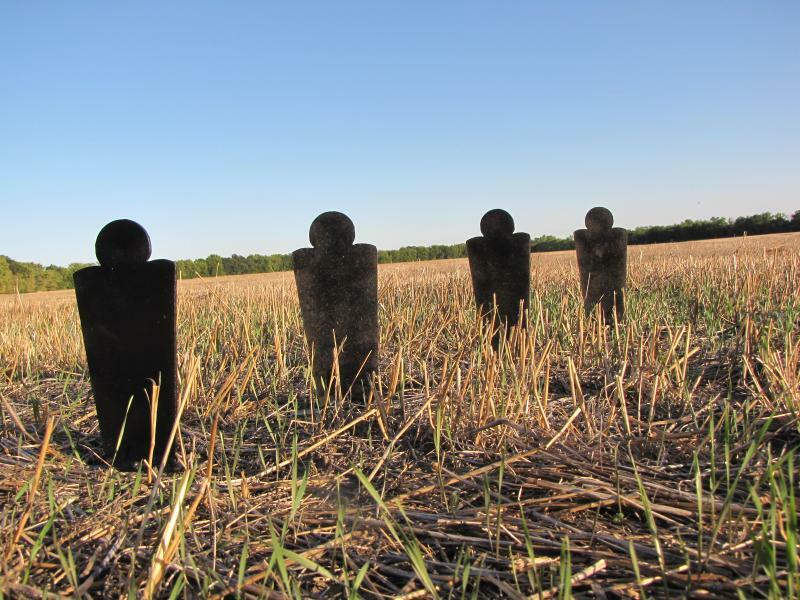 4 steel ZOMBIE shooting targets ﻿ 1/8"
SAME as above, each Zombie being 10" tall. HOWEVER, these are 1/8" thick. Great for pellet guns! 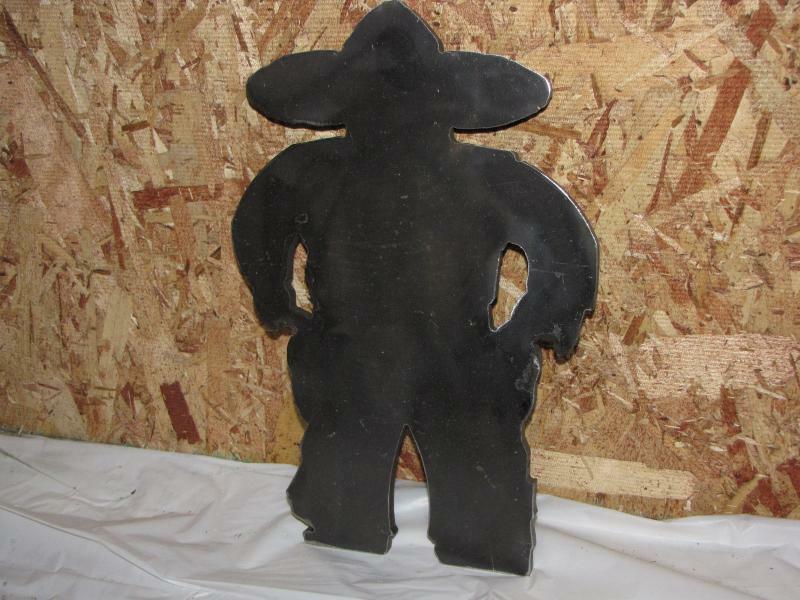 4 steel TORSO shooting targets ﻿1/8"
Each TORSO IS 10.125" tall, 4.25" across the shoulder, 3" across the bottom and 1/8" thick. GREAT for pellet guns! Buffalo is approx. 6.75" x 4.75"
Bear is approx. 6.75" x 4"
Moose is approx. 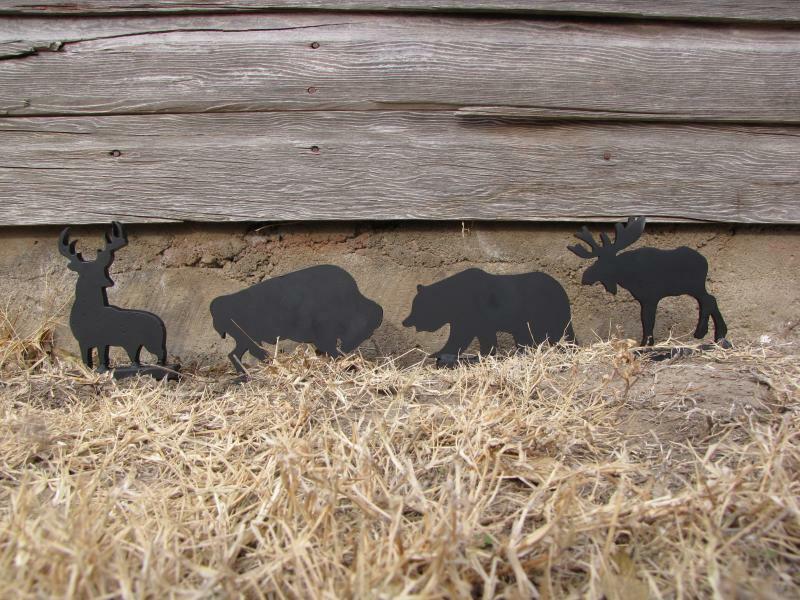 6.25" x 6.5"
4 North American Big Game ﻿1/8"
All are of 1/8" thick. Perfect for pellet guns. 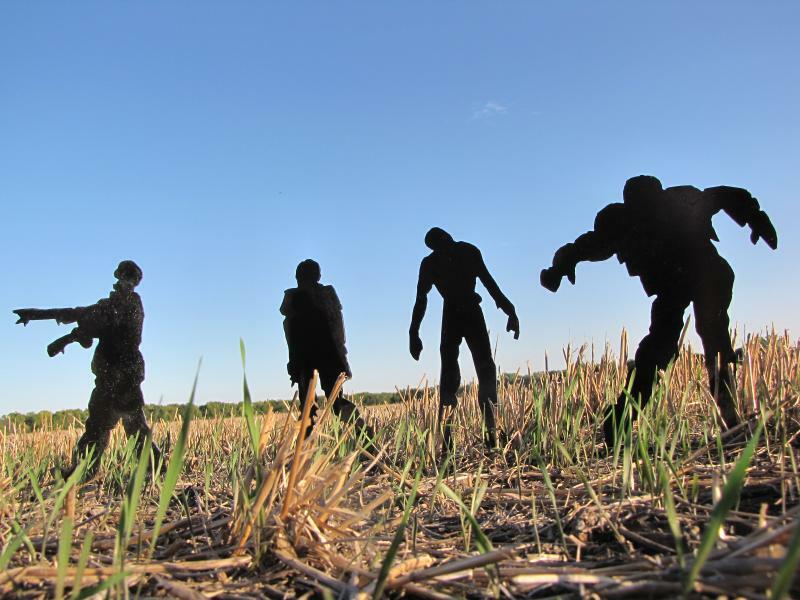 Zombies are 10" tall from the top of the head to the feet. There is an extra 2" base plate that attaches to the flapper. These Zombies are 3/16" thick. In the Old West movies, there was an 'ol skinny guy. We have ours too. Each cowboy is 10" tall and 3/16" thick. There are 4 targets in this set. 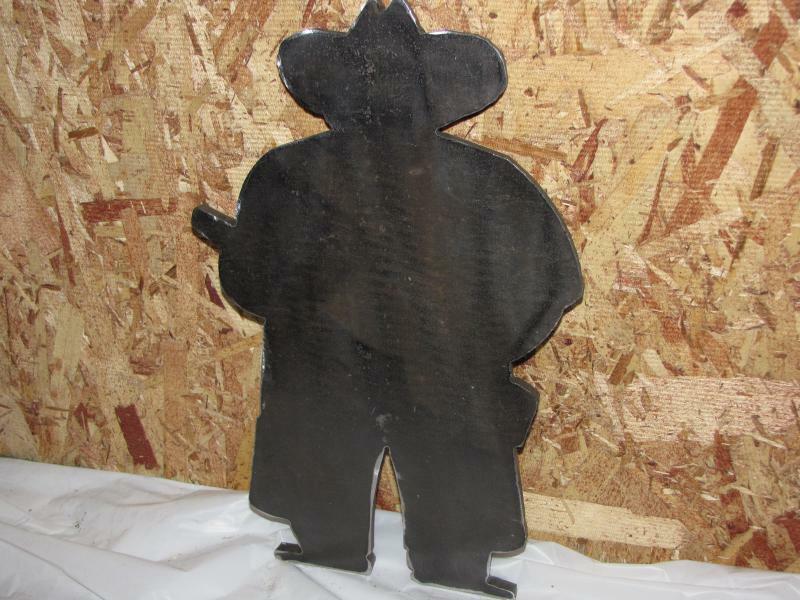 4 steel Cowboy shooting targets ﻿1/8"
These cowboys are also 10", however, they are 1/8" thick. Perfect for pellet and air soft guns. Shipping price reflects on one set. Larger upper: 12.625" x 6.625"
Smaller upper: 6.375" x 3.375"
Tall body: 5.75" x 3.5"
Medium body: 4.187" x 2.25"
Both the BLOB ZOMBIES and Clown targets are between10" - 10.25" tall x 3/16". You choose either the BLOB ZOMBIES or Clown targets. You get a total of 8 targets in this set...4 of the Zombies and 4 of the Blobs.....get them before it's too late! Cape Bull 8" x 7"
Targets sold are NOT painted and will look like the photo above. 45 seconds of spray paint will get them ready...IF you want them painted. Just like our 10" versions, but only 5" tall. GREAT for shooing with high powered pellet guns! Yes, you get 4 targets in this set. *painted for display. Actual targets not painted. Thank you for looking. We offer MANY more targets that have yet to be displayed. We are currently working on this project. Thank you. 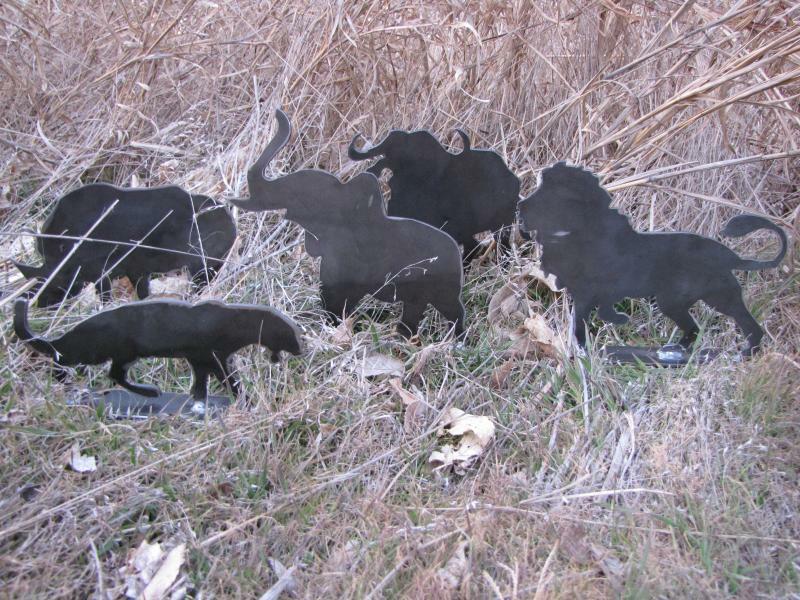 All of our 3/16" targets are cut from 7 gauge hot rolled steel, ensuring hours and hours, and even MORE hours of shooting time. You will be hard pressed to need any more targets after these. 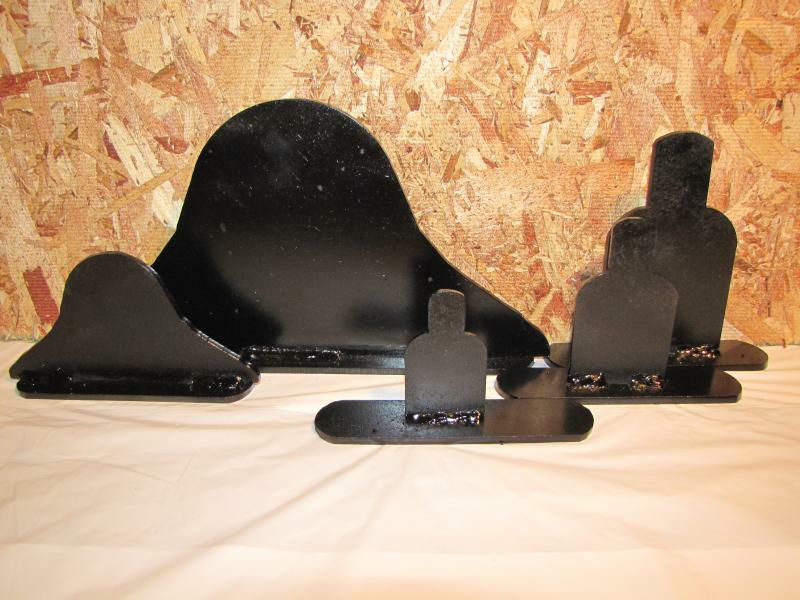 Our 1/8" targets, a lighter version of the heavier 3/16" targets, are perfect for high powered pellet guns, air soft and paintball shooters. 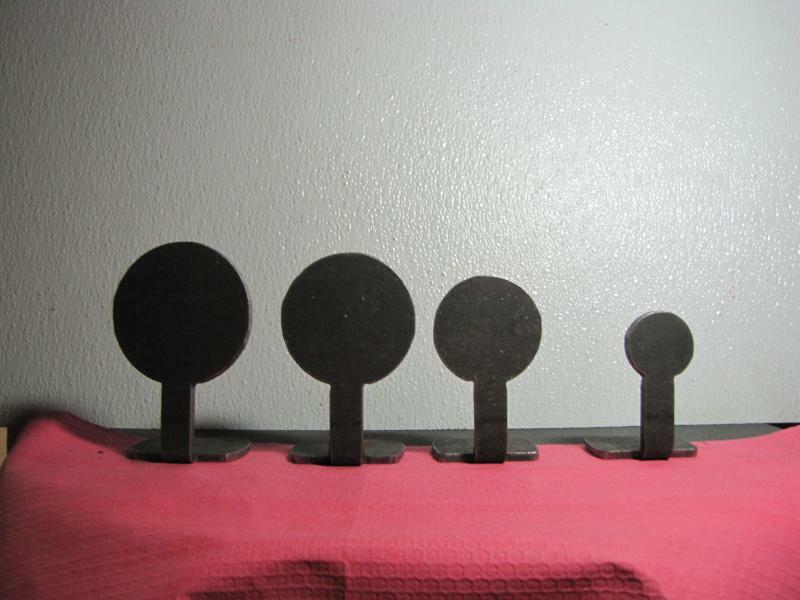 Our other targets use heavier, high strength steel in sizes from 1/8" to 3/4"....big enough for your 5.56 or .50 cal black powder. Some of the targets you see have been painted so they show up better in photos. Targets shipped will not be painted. A quick coat of cheap spraypaint does the job. We will combine most of the shipping on multiple targets. Please contact us for shipping rates for extra targets. ﻿The TOROS targets are a favorite of longer distance shooters. Try hitting these at 100+ yards. Ever want to hunt the big four game animals in North America, but could not afford it? Here is your chance, although not as dangerous. Kids love these targets, and so do the young ones at heart. Put them in some tall grass, around some dirt clumps or other another native surrounding and you are ready to go. Or you can simply put them on the target line and have others wish they could be on your lane. These ZOMBIES are 3/16" THICK and HEAVY DUTY!!! They are made of 7 gauge hot rolled steel and are attached to a 3" x 6" heavy duty rubber auger belt. YOU attach the rubber 'flapper' to your own platform. Targets bend back when shot and 'flap back' in place ready to go again. What you see is what you get. YOU provide the bolt / screws to attach to your own platform. These two Cowboys are itch-in for a fight. Set up on your own heavy duty target base or prop these fellers up. They are ready for some heavy duty Cowboy action. Your choice of either the 'Scatter gun cowboy' or 'Draw from the hips'. You will need to tell me WHICH ONE YOU WANT when you order. These two cowboys will hold up to just about ALL handgun loads from 25 yards + and most rifle loads at 40+ yards. This is our newest adventure into the target world. Need some action to get things going? And as always, there is the skinny sidekick to go along with 'em. These chickens stand and are ready for some shooting. Face the target body closest to you and get your .22's ready, or, turn around for less resistance and now you have a perfect target for your pellet gun. 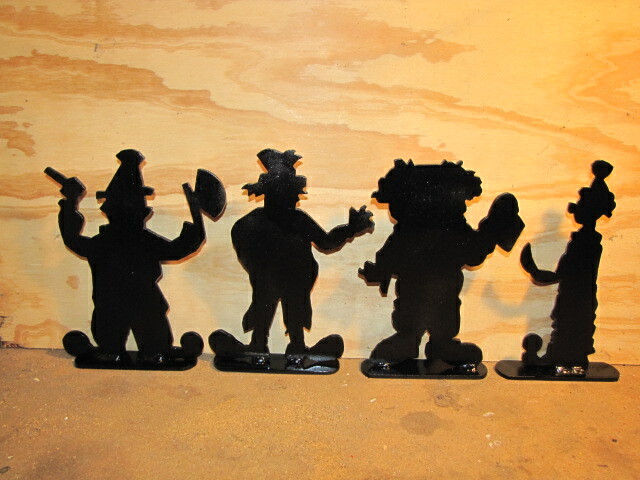 Our BLOB and Clown targets are a favorite with the younger crowd, and for those that hate clowns. These targets really stick out when you look at them through a scope at 75 yards. I think they look even better at 125 yards. The standing circle targets. One of the most simple targets to shoot, yet one of the most fun. Put the target face closest to the shooter for .22's or farthest away for high powered pellet guns. You get EIGHT standing targets in this group.There are 4 Zombies and 4 Blobs! You can't go wrong with this one. CAUTION: Do NOT keep these targets in your home overnight. This photograph does not do these targets justice, sorry. I'm in the process of building this page and just haven't had time to take a good one. Anyway, if you worry about the photo too long you'll be another victim. Of theirs. This is one of our reactive targets. Hit the center and the top targets comes up. Hit the top and the center target resets. Fun! This is one of our 'new sellers'. Perfect for use with lot and high powered pellet guns...put a hurt on them before they get to you! Title says it all. 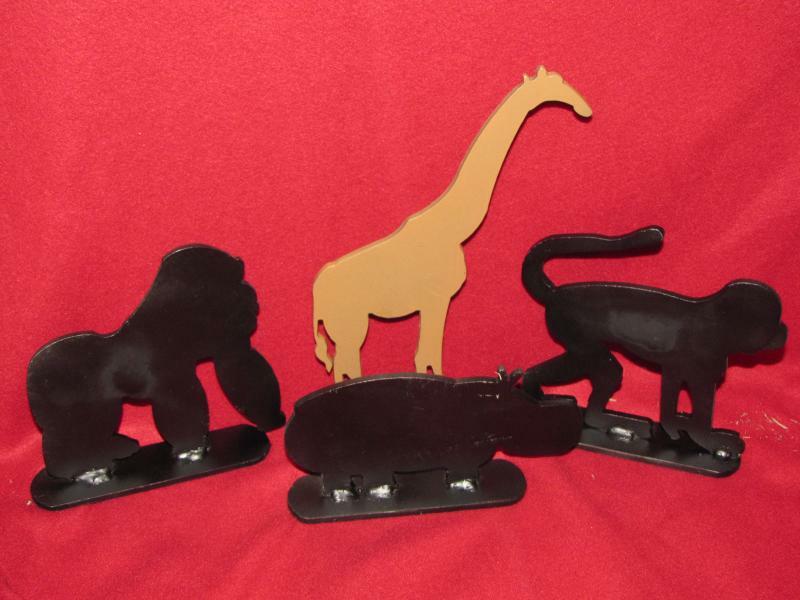 Wild Jungle Animals at your shooting range, without the cost of a trip to Africa! 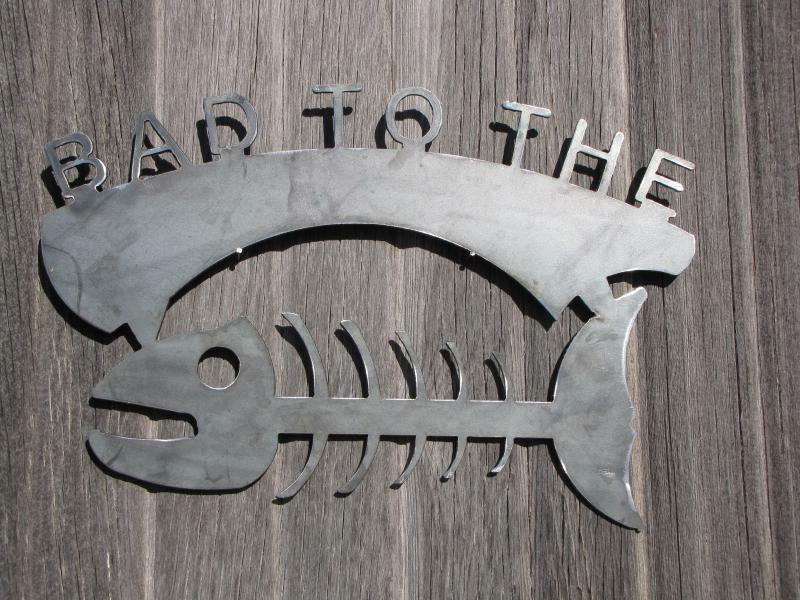 Perfect for that big trophy to hang on your wall! 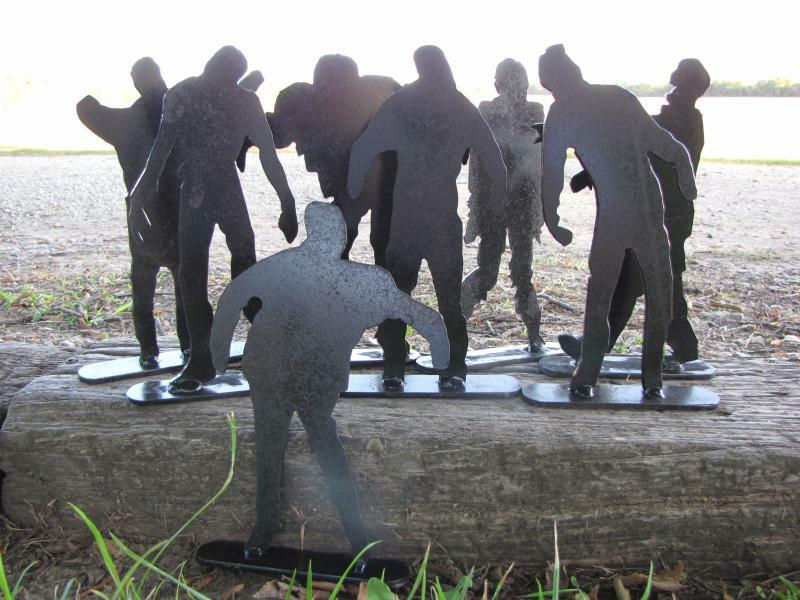 Our new 6 foot zombie targets! Contact us for a quote.